Book Review: Ever wondered how nature transforms a Caterpillar into a Pupa and finally making it fly high as a Butterfly? Well, this book is about a similar metamorphosis happening in the life of the author herself. In fact the author believes that such a transformation can happen in the life of every person who chooses to believe and follow the path of Jesus Christ wholeheartedly. The story is a testimony to the events happening in the life of the author who was a staunch Buddhist and just like the way any big change in a person's life has a supporting experience, she too went through a perplexing ordeal which graduated her towards Christianity and Jesus. A beauty contest doesn't sound like an event which could lead to something as serious and spiritual as changing one's life or identity but here in Winnie's case it did which gives us a reason to believe God's strange ways of guiding us towards the purpose and goals of our lives. The writings of the author although qualifies as Christian book and every believer in Jesus would love to read it but the things that stand apart are the honest feelings evoked by the author and the positive vibes one gets by reading it. Even though the author accepts Jesus as her true God and savior yet she does not in any way criticize or discredit Buddhism or other religions which is commendable on her part. The experiences mentioned are not superficial and could happen to any normal person. Also, the book includes verses from the Holy Bible which have been nicely placed among the related parts in the story. For the poetry lovers there are some nicely written ones which give a light feel to the story. Similarly, the gospel songs with the piano chords and the inspirations could interest an instrumentalist. Finally, the book ends with spiritual chapters like 'My Journey Of Transformation' and 'The Tremor' where she lists thirteen positive changes or improvements which she noticed in her life since her baptism and an earthquake tremor which makes her understand the futility of human life and the need to constantly redeem ourselves in order to be able to re-unite with the supreme being. So how did Winnie achieve this miraculous transformation? How did her family and society react to it? Was she able to entirely overcome her suffering? 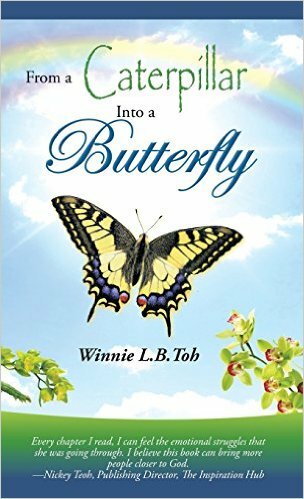 Read this beautiful life journey of Winnie to find out the answers and get inspired to shed your cocoon and fly like a butterfly! Share book reviews and ratings with The Readers Express , and even join a book club on Goodreads.